What’s in a Social Security Number? A lot more than 9 digits. What's in a Social Security Number? A lot more than 9 digits. Last spring, my wife and I welcomed our second daughter. She arrived 11 days early, weighed just over 7 pounds, and like her sister, has beautiful blue eyes. Our hospital stay was a blur, as it is for most parents, with lots to take care of, including an application for our daughter's Social Security number. When her Social Security card arrived a few weeks later, it struck me that this series of nine numbers will be with her for the rest of her life. From her taxes, to her driver's license, and even her credit history, her Social Security number (SSN) will widely be used as an identifier to gather information about her. Social Security numbers have come a long way in its 82-year history. Today your SSN serves as a sort of national ID for U.S. citizens and residents—but it wasn't always that way. The Social Security number was created in 1935 solely as a way to track citizens' work histories and salaries to determine their Social Security benefit entitlement.1 When the Social Security Board decided to use numbers to implement the tracking system, it was controversial at the time, because the U.S. government had never issued individual numbers like this. The first SSN, 055-09-0001, was given to a New York resident by the name of John D. Sweeney, Jr. in 1936.2 Within the first 8 months of registration, the government issued SSNs to 35 million workers, which was a huge administrative undertaking.1 And it wasn't all smooth sailing. Many individuals received multiple SSNs, and there was a lack of understanding around the SSN. Some people thought you needed a new number every time you got a new job or the more SSNs you had, the better. Last year, and for the first time ever, hackers stole more SSNs than credit card numbers, according to a 2018 study by Javelin Strategy & Research. Once a thief or fraudster has someone's social security number—which is needed by banks to extend credit or open an account—they may be able to apply for credit in that person's name, or file fraudulent tax returns, among other illegal activities. The exposure of millions of SSNs is scary, but there is a silver lining. Capital One® has tools available to help consumers protect their credit and quickly detect fraud for free. CreditWise® from Capital One has three new features to help users keep tabs on their Social Security number. 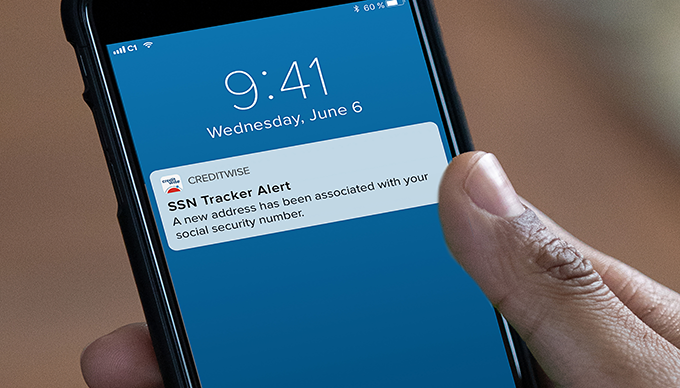 · Social Security Number (SSN) Tracker:CreditWise now tracks the names and addresses associated with credit applications linked to a user's SSN, as reported by Experian, and alerts users when their SSN is used to apply for credit. · Dual Bureau Credit Alerts:CreditWise sends users alerts when meaningful changes, like applications for a line of credit, occur on their Experian and TransUnion credit reports. · Dark Web Surveillance:CreditWise now scans the dark web, including thousands of unsafe sites, hacking forums and illegal digital marketplaces, and alerts users if it finds their Social Security number or email address so they can take action. CreditWise is free for everyone—whether you're a customer or not. In addition to enrolling with CreditWise, there are further actions consumers can take to spot credit fraud and quickly take action. · Get a Free Copy of Your Credit Report: Once a year, consumers can get a free copy of their credit report from the three major bureaus (Experian®, Equifax®, TransUnion®) at annualcreditreport.com. It's important to review all three reports—some lenders don't report to every bureau, so they may have different information. · Add Fraud Alerts to Your Credit Report: Consumers can put a fraud alert on their credit reports if they are (or think) they may be a victim of identity theft. Once a fraud alert is in place, lenders must take extra steps to verify the consumers' identity before issuing credit in their name. · Freeze Your Credit: Consumers can consider a credit freeze if they think they are the victim of identity theft. This is a tool that lets consumers restrict access to their credit report. And since most creditors need to see the person's credit report before they'll let someone open a new account, this could make it harder for potential thieves to apply for credit or open accounts in their name. Tracking SSN fraud can be especially difficult, since typically most people are not regularly monitoring for fraud. More often than not, people only notice that fraud has occurred during significant life events or times of the year, like when they go to file their taxes or buy a house. Luckily there are tools, like CreditWise from Capital One, to help keep an eye on this important number. To learn more about CreditWise: visit creditwise.com or download it in the App Store or Google Play Store. As Managing Vice President of US Card and Head of Emerging Segments at Capital One, Jeff Amster focuses on helping customers succeed, accelerating the company's technology transformation and empowering his teams to do the greatest work of their lives. In his role, Jeff oversees business strategy and product development of flagship card products, digital services and innovative customer solutions. A seasoned Capital One executive, Jeff joined Capital One in 2003 and has held several leadership roles in his 15 years at the company. He also currently serves as a Credit Officer for Capital One. Jeff is a graduate of Yale University with a bachelor's degree in Economics.